Race day dawned cloudy with a cool breeze from the North-east. It looked like a good day for getting the miles down, and with the 1 hour earlier start this year we would have a little less pressure to get to Fort Augustus before everything shut. I settled into a rhythm reasonably well on the opening section, but clearly not able to match the pace of some of the front runners. This was a long race, and I wasn’t about to blow up on the first day. Although happy with the ride of my Shand, it was still new and I was finding its limits on the descents and trying to be cautious and not take risks that could end my attempt before it had really got going. Annoyingly, having negotiated the difficult top half of the Devil’s Staircase descent, I clipped a small sharp rock and slit my rear tyre. Starting with two spare tubes and two tyre boots seemed perfectly adequate for the race, until you need to use one of each within the first 30km. 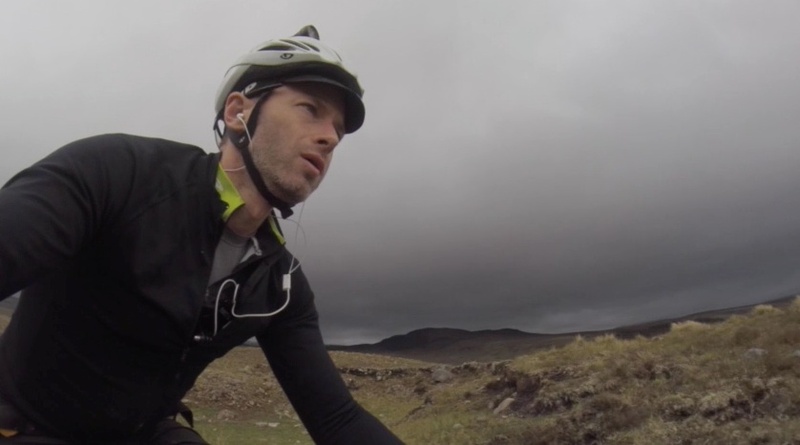 Apart from the persistent north-east wind, Day 1 turned out to be a repeat of last year with me getting to the same place – a bothy at approximately 190 km into the route. Whereas I was on my own last year, it was now a suitable overnight target for many, and I found myself occupying half the porch at 1:30am while everyone else slept in the other two small rooms. That in itself wouldn’t have been a problem, except for the fact that those that arrived earlier decided to get up at 4:45am, forcing me to do the same. Three hours sleep on the first night wasn’t ideal by any means, and by late morning I was already starting to drift off to the sleep on the bike. In an attempt to find somewhere to get half and hour shut-eye, I was unlucky to find an infestation of midges which forced me back onto the trail. I opted to take a caffeine gel to try and perk me up, and this did work for a while, though there was still a lot of the day left to ride. The plan for Day 2 was to get well into the new northern section. Peeling off the Ullapool mountain road, the route drops down into Oykel Bridge and follows tarmac for several kilometres down the valley, before heading up Glen Cassley and breaking out of the top and over to Loch Shin. This section was punctuated by a very enjoyable cheeseburger at Rosehall Hotel, where a cup of coffee and a can of coke gave me that boost for the evenings riding. After Loch Shin, the climb up the valley along Bellach nam Meirleach was into a vicious headwind – the strongest I’d experienced so far in the race. There was no cover to be had anywhere, and even the prospect of stopping to bivvy was out of the question. 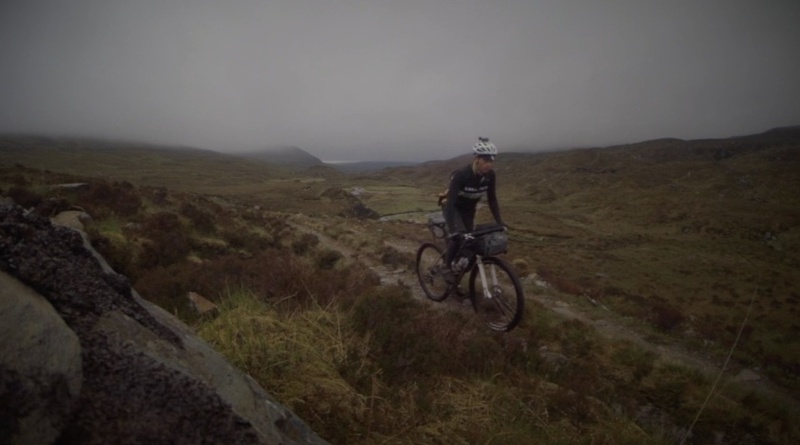 Eventutally I reached the bottom of Glen Golly, which marked the turn westward along the top of the northern loop. I continued up for a bit looking for a suitable bivvy spot with a degree of exposure to keep the midges away, but not too much that I’d get saturated if it rained. The strategy worked to a point, in that I wasn’t bothered by midges while the wind was blowing. It marked the end of a 200 km day with 2,200m ascent. I was content with that. By morning the wind had dropped to nothing and the midges were thick. I’d elected to sleep with my midge headnet, sleeping bag cinched up tight under my chin to keep the winged teeth at bay. It worked, but now I was faced with the challenge of getting up – something I’d not given a lot of thought to when getting in the previous night. Dragging my shorts and leg warmers into the bag with me, I got my kit on in my sleeping bag. Not as easy as it sounds, I can tell you. Once up, I hastily stuffed my kit back into its bags and headed off to find somewhere windy where I could eat instead of being eaten. Day three started with the passage through top part of the northern loop. Shown on the map as a simple dashed line, it could be anything between a double stone track, a sheep path or nothing at all. The reality was pretty much just that. The double stone track steepened to the point of being unrideable, before turning off onto a sinuous narrow path through the peat. Rideable, but technically quite difficult to maintain the narrow line. Venture off it and you’d find yourself on soft ground and having to dismount. Don’t stray off the path! 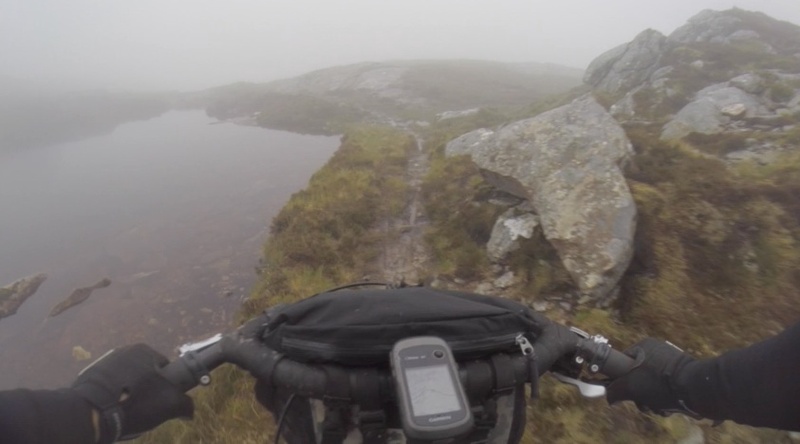 High in the cloud with visibility only 30-40m the path skirted around Lochan Sgeirach and its associated pools. The environment and atmosphere was like that of another world. The track eventually turn down to An Dubh-loch, where broken peat-hags made for a challenging carry for a few hundred metres. 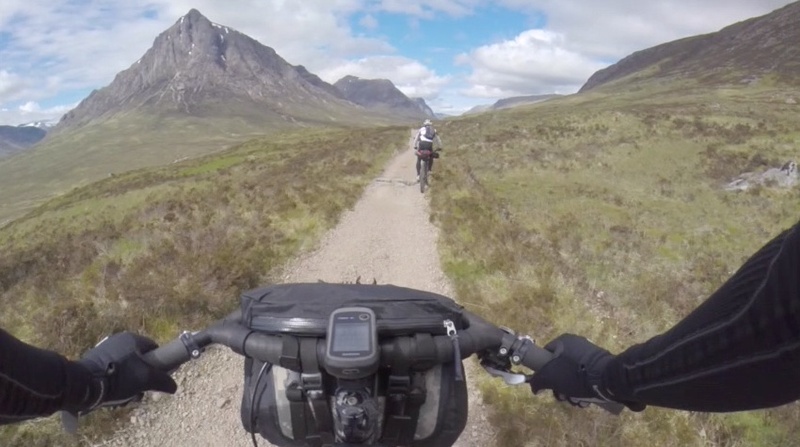 At this point, the stone double track re-emerged, ripping straight up the opposite side of the valley to gain the high point of the day – Beallach Horn (520m). It was downhill from there to practically sea-level. An amazing descent. 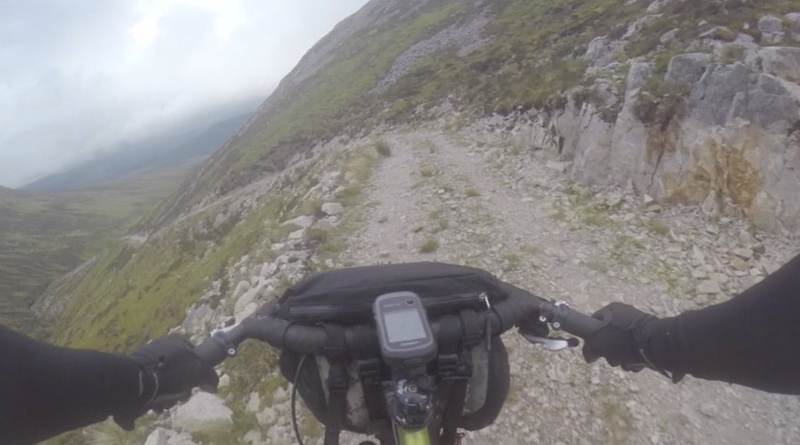 After Achfary, the route rears up again to get over the hill to Kylestrom, before following the lumpy coast road through Drumbeg and onward via some extra bits of singletrack to Lochinver. It was here that the accumulated effects of the hike-a-bike showing. My left achilles was really quite sore. If I’d thought about it earlier, it’d probably been like it way back in Achfary but I’d shoved it to the back of mind and tried to concentrate on the riding. The fact was that walking on it was getting painful, and riding with any significant pressure on the pedals was also uncomfortable. I took some ibuprofen and strapped it up as best I could, but the outlook wasn’t good. I figured if I can get to Oykel Bridge, I can make an assessment there and decide if I’m able to continue. The Lochinver to Ledmore Junction traverse turned out to be the crux of the northern loop, or at least that’s how it appeared to me. I hadn’t got far along it before I was off and pushing – unable to push the pedals enough to get up some of the technical rideable bits. By Suileag bothy, I was done for the day. It was only 6:30pm and I’d only covered 85 km, but with 2000m of ascent. That’s a lot of climbing for the distance. At the start of day 4, my ankle was still swollen and tender to touch. A small lump was evident on the outside of the tendon, and it was clear that I was not going to be able to continue to Ullapool and beyond. Having spent the night in the bothy, all my thoughts were devoted to what I was going to do next. I hoped that some rest would help, but by the morning it was evident that there was more to it than that. My evacuation route was east anyway, so I continued along the route as far as Oykel Bridge. The challenge came in trying to get off the traverse to Ledmore. I started riding at just before 6:00am, and it took nearly four hours to cover the 15km to the road. If there was any uncertainty about my not continuing before I stated, there was no doubt by the time I reached Ledmore Junction. Every foot placement needed to be made with care, and riding could only be executed on very flat or slight downhill, where trail surface permits and suffice to say, even the downhills weren’t easy. I rode the road to Oykel Bridge and called into the hotel. I wrote my text to Greg May – who was keeping a record of race scratches – to say that I was going to pull out of the race due to my achilles. My finger hovered over the send button for a while not wanting to press it. But there was no other option. It would be silly to carry on with an injury into more difficult and remote terrain. 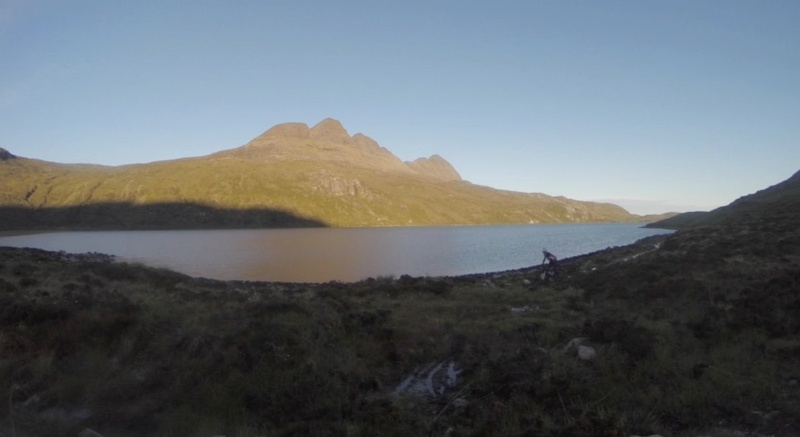 Fisherfield. Torridon. Glen Lichd to Glen Affric. They’re all tough unrelenting sections and not places you want to find yourself incapacitated. I felt like I’d prepared for this in every detail. The route – or the vast majority of it – I knew. I’d honed my kit from the previous year, and against all odds got myself a brilliant bike to ride at the last minute. Both bike, food strategy and bivvy gear didn’t let me down – it all performed flawlessly and as expected. What let me down was me. My Achilles heel turned out to be my Achilles heel. I never allowed for, or even imagined, that I’d not get around the route because of some failing on my body. I still don’t understand fully what caused my problem. I’m no stranger to hike-a-bike and didn’t feel my approach or execution to this race was substantially different to last year. Perhaps this just highlights the seriousness of the race. Few make it around without any complaint from somewhere on the body, you just hope to get to the finish before anything becomes too serious. For a while I doubted my decision to quit. I felt I’d given up too easily. A couple of weeks later and after some stretching and strengthening exercises, I think I’ve now come to terms with it. My ankle is still on the mend, but I can be confident that I’ll be back on the bike fairly soon and get back to normal. As ever, you learn more through failure and I’m beginning to build a plan of what I need to do for next year. Good write up mate. Shouldn’t be to hard on yourself, always trying to account for everything in a race as tough as this is never going to be easy. Any chance it was a bike set up issue, having not had long with it? I think it was a footwear issue mostly. Lack of support or over-flexing. I was very careful with the bike setup, and am sure that wasn’t the issue. Knees, neck and shoulders tend to give first if anything is wrong in terms of riding position.